One of the two elderly people missing in Roswell has returned home, but the Roswell Police Department is still seeking the public’s assistance locating another. Bobby Satterfield, 72, was reported missing Tuesday but has returned home on his own and is safe. Leotta Talbert, 80, has been missing since Sunday, when she departed the Eastern New Mexico Medical Center. Video surveillance from the hospital shows Talbert leaving in a dark-colored jacket, a blue, possibly denim, long skirt, and white shoes. She may have had an IV in her arm. Talbert exited the building, found her car – a white 2011 Ford Fiesta bearing N.M. plate 502SBM – and drove south on Kentucky Avenue from ENMMC. 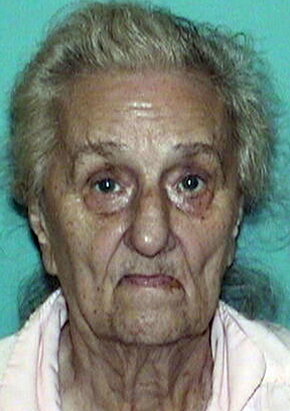 She is described as 5’7” with blue eyes and white hair. Talbert had not been discharged by the hospital an is suffering from the onset of dementia. Talbert is considered in danger if not located. Anyone with information as to her whereabouts is asked to contact the RPD at 624-6770.